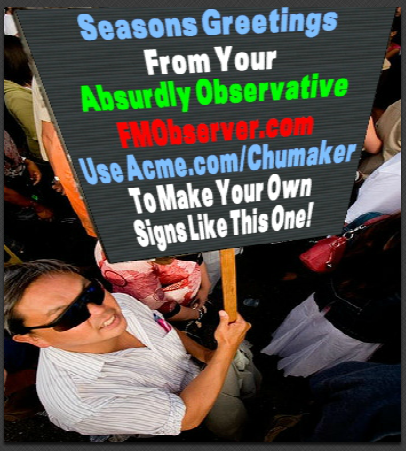 Southern North Pole – Since saying Merry Christmas is possibly offensive to some, we here at the FM Observer Headquarters want to wish all our faithful readers very warm Winter Holiday greetings, to hopefully help counteract the recent Global Cooling which seems to have overtaken our area thanks to carbon-taxing Algore. The FM Observer was boldly begun about six years ago by co-founders Cody and Nick, who simply wanted to provide an alternative to all the bad, real news. Cody is sadly no longer with us. Nick is related to Jolly Old St. Nick, who happens to be our Nick’s God-Santa. After six long years of being at the vanguard of exclusively satirical fake news, we have unfortunately (for some) decided to renew our contract for another six years. So, for any folks who wished we would just go away like Al Franken is from the Senate…no, we are here to stay – just like Robert Mueller’s never-ending special investigation into possible collusion with the Russians.